Iain Overton, a well traveled and experienced reporter, has written an immensely readable travelogue-come-snapshot into the modern realities that surround firearms. Overton now works for Action on Armed Violence whose central mission is to “reduce harm and to rebuild lives affected by armed violence.” While that might explain what is largely an anti-gun narrative, it is hidden within Overton’s excellent storytelling as he travels the globe in a sort of “around the world in 80 guns” adventure. The purpose of Overton’s journey is to explore the pain, power, pleasure and profit that are connected to the ubiquitous gun. He admits his undertaking is ambitious and tells his story via the dead, the injured, the suicidal, murderers, criminals, police, military, those who use guns for pleasure, and those who operate its industry and protect its interests. The scope of the issue and its impact mean that the work almost inevitably poses more questions than it answers. Each of the topics is worthy of a study of its own from the details of suicide, child soldiers, to the huge U.S. hunting industry, but what Overton’s does is provide a snapshot that tells of the scale of the issues but doesn’t get go into any real level of detail. Instead you come away with stories, individuals, and statistics that scratch at the surface of the issues that spin off from this particular human creation. Overton’s air miles must be in the stratosphere following the research he put into the book. From Israel, to South Africa, from Central America to watching a gun-toting model firing an automatic weapon in Cambodia, Overton is never going to be short of dinner party anecdotes. Backing this up is a shotgun blast of statistics that set the scale of the scene. International studies estimate that there are between 526,000 and 600,000 violent deaths annually, with guns responsible for some 300,000 of them. Meanwhile 800,000 kill themselves every year across the planet, with 200,000 seeing their end via a firearm. So some half a million people are dying every year from gunfire. Civil conflict, not war, is the arena for this book. 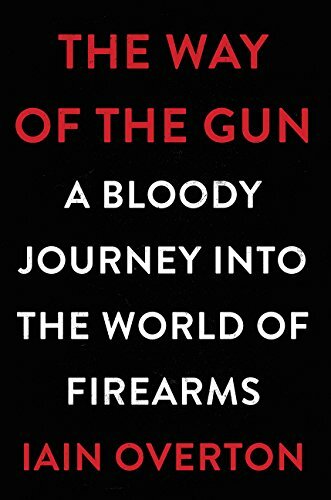 As Overton puts it in war “when the gun’s impact is so extreme, nothing will properly describe or explain it.” So the definition of book is very personal as the author, despite being a member of a gun club when he was younger, is no real expert. This means the reader is genuinely taken on the journey, although on the flip side sometimes the lack of definition and grip makes for some degree of drift. As one gun seller Overton meets says “gun is just one word, but it says a million words.” The book is sometimes guilty of a sensationalist tone with introductions such as going “into the heart of darkness,” and the use of gun logos for page breaks in the hardback edition is unnecessary. America receives a fair share of attention and visits. The country where mass killings are regular news, some 30,000 die a year from guns and the president sheds tears of live television about his inability to stop the slaughter. Overton looks into the increasing militarization of the police with some 50,000 SWAT raids each year but doesn’t delve into the racial components that are making headlines at present as part of the Black Lives Matter campaign. The history and constitutional importance of guns means that the author is correct that “imposing gun laws without a cultural shift in attitudes to guns is not going to work.” Yet while the NRA focus on “rights not weapons” with the ubiquitous “the only way to stop a bad guy with a gun is a good guy with a gun,” you can feel Overton’s exasperation with a reality that even sees gun sales go up following each mass shooting.